The E*13 TRS Race 11 Speed Cassette 9-46T offers an impressive 511% range thanks to the 9-46 gear range. That is 11% more than SRAM's 12-speed Eagle Drivetrain, which means you get to keep your 11-speed group-set and save yourself all that hard-earned money you would've spent the 12-speed group-set. E*13 TRSr's innovative design allows the cassette to be separated into two or three pieces, allowing you to replace the high wear parts individually without making you fork out the cash for a completely new cassette. The 9-46 gearing allows you to climb up the mountains and blaze you way down the descents, leaving no terrain that can get in your way. I was worried with its wide range of cogs that it might miss something in between, but it's very linear, perfectly spaced ratios. Shifts good with very little hesitation. 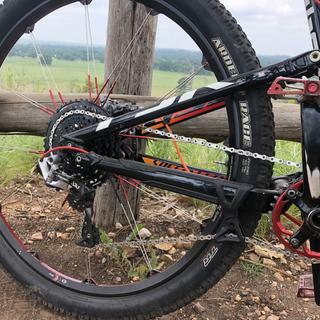 I run it with a 30t ring up front and can now clean the steepest climbs that I couldn't make before and still have more than I need for the downhill. Expensive but have no regrets so far! I used the cassette for 3 months on a 2017 Trek Top Fuel and the shifting became difficult. The bigger cogs were not a problem, but the smaller cogs miss shifted and/or jumped into the smaller cog. My mechanic noticed that the bigger set of cogs were loose. The cassette comes with a tool to tighten the bigger part of the cassette. The cassette was tightened not once but twice. The second time we used blue locktight and it managed to loosen itself. I put the old Sram cassette back on and had no problems. I will eat the cost as a lesson learned and will not sell the item. Thank you and sorry for the initial review without updating sooner. Lightest cassette I have ever had, easy as pie install, shifts smooth with my XT setup. Pricey, but got 15% discount which took some sting out. Extended gear range is awesome - I think all 1x setups will end up going this route soon, so hopefully price comes down with competition. Solid recommend if you can spare the $$ - this is up there with a dropper post as far as recommendations go. Nothing else quite like it. I built up a new XC race bike this past spring and decided to build it around a Shimano XTR M9000 drivetrain and this cassette. 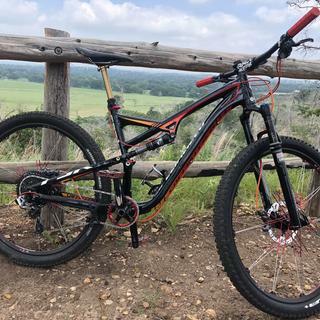 The range is fantastic and the shifting was almost as good as a stock Shimano setup. However, I did have to replace the smaller cluster about 2/3 of the way through the season (about 300 miles of riding since I use another bike for my day to day training). The teeth break and bend very easily and I reached a point where the chain would slip in the 3rd smallest cog (9th). Replacing the cluster fixed the issue but at a cost of $200. Now, I'm starting to reach a point where it's occasionally slipping again in 10th but I still I will go with a cheaper cassette next time around. This could end up costing me at least $1,000 per year. This product gives me more gears! My new bike has on XD driver and the stock cassette is 10-42. I need more gears and $420 for a Sram Eagle upgrade with 10-50 cassette plus chain, rear derailleur, and 12 speed shifter is overkill. The E*13 cassette shifts well, even under load. It helped me clear some steep hills and I was able to use most of my stock drivetrain. Live the extra range. A bit expensive though. SRAM should be making this for an intermediary component, so good on the hive for at least giving us something I want instead of an overpriced 1x12 system. Great range but you pay for it. Only a few rides on this cassette but so far all good. Shifts very well. Also having the 46T rear to go with a 32T front is great. Perfect for those super steep "climb trails" here in British Columbia. Then when it's time to tear down the bike park where speeds are high... boom! The 9T has you pushing gear instead of spinning cranks. Oh, and it's not gaudy gold coloured like brass bathroom fixtures from the late 80's early 90's. All black like it should be. Only giving it four stars as I think it is priced to high. I switched from an E*13 9/44 to the 9/46. The three larger climbing rings are all larger and really help out with extremely steep climbs. The weight saving is just an added benefit as well. Yep, this thing is awesome. Light, awesome range, shifts great after some derailleur tuning. Expensive as crap, but still awesome. Another excellent product from E13 ! I really like this E 13 casette. Light weight and the excellent gearing. Simple to install and remove (to remove you will need 2 chain whips). Purchased this cassette to replace my S=RAM 10-42 cassette after it wore out. The e.13 cassette was easy to install and provides a nice upgrade to my bike. I am a big fan of these. 303g and 9-46 range (511%). I chose to use them with 11 speed long cage xtr components. So they are lighter, and cheaper than eagle, with more range, and you can upgrade your 11 speed setup. The only bad (from reading) is lifespan (three largest cogs aluminum... but remember this is for race... cheap, light, durable, pick any two) and maybe slightly inferior shifting smoothness vs eagle. Good news is that it is two piece, so you can replace only the teeth that need replacing. It’s ok... but no matter what shifter, cable tension or adjustments are done to this it always seems to have indexing issues. Dial it in for climbing, you run into chatter or cog jumping at speed, dial it in at speed and you get cog jumping and or chatter when climbing. No matter what shifter I’ve installed I have experienced the same results. It’s a very frustrating thing to constantly have transmission issues. I’ll be looking to swap transmissions / cassettes soon. 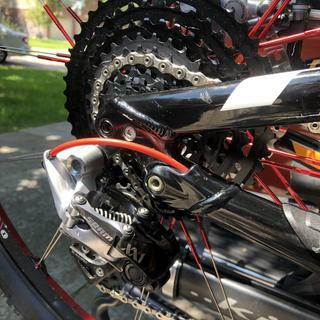 the cassette is only held onto the freehub by a pinch bolt that clamps the larger 1/2 of the cassette around the smooth part of the XD driver, held on only by friction. this clamping surface is only about 4mm wide where it actually clamps around the freehub body. it does not have a lockring to permanently and securely lock it onto the freehub, unlike almost every other cassette out there. installed perfectly according to e13 tech doc, but the cassette slid laterally on the freehub body to the drive side hit the frame, taking a chuck out of the carbon frame. e13 offered NO help and said thats no possible to avoid liability for damaged frame. BTW this was on a brand new bike, new cassette, new ethirteen plus wheelset. put the cassette on a brand new x0 hub and the same thing occurred. Even if this is a one-off manufacturing defect it is a TERRIBLE design. 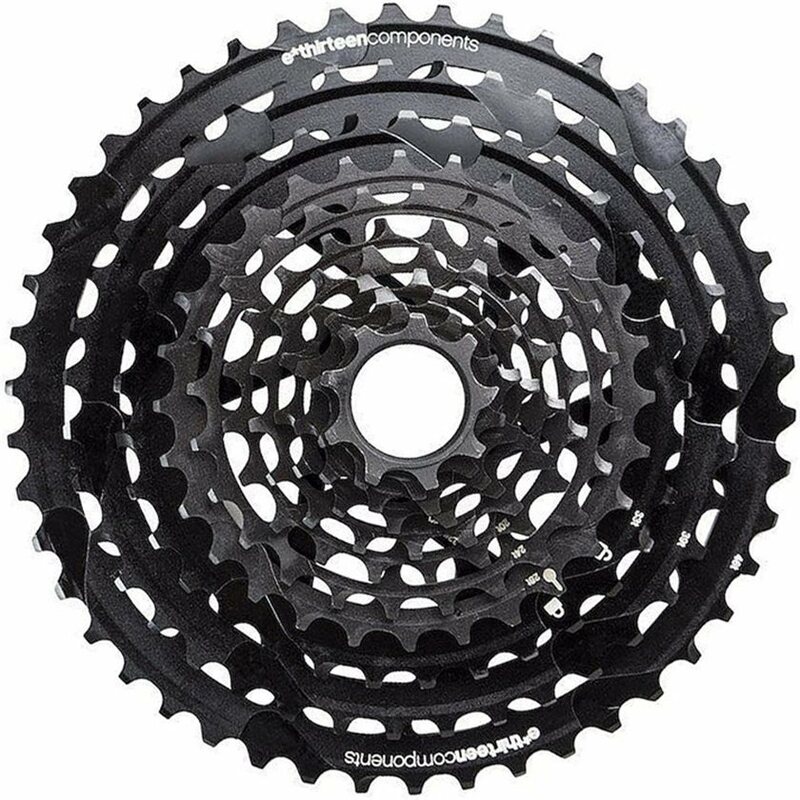 I have worn out 2 11 spd cassettes in the last 4 years, the 11 tooth gear on both, all SRAM, my 2 chains that I used are still good the 050 gauge will not go. In addition the sram cassette creaks like hell and I’ve tried everything to stop this noise, grease, torque, you name it, all cassettes were xx1 type. I’m hoping this 13 TRS will solve my problems as far as the creaking and being able to c/o only the smallest 8 teeth when worn will be more cost effective. I deeply regret this purchase. I wore out the large aluminum rings within five months (mostly the 33tooth). Shifting adjustment is super sensitive. 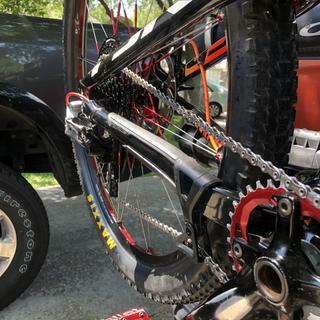 I replaced the aluminum cluster and the chain is already jumping in two months. You can feel the play between the two halves of the cassette. The teeth wear our ridiculously fast. Stick with Shimano/Sram. What derailleurs are compatible with this? BEST ANSWER: Supposedly any 11 speed... however I’d recommend going with a different cassette/group set... unless you love transmission problems and thoroughly enjoy tinkering with cable tension/barrel adjusters and chain chatter/cog skips are music to your ears. I’ve had identical problems with both TRS+ and TRSR cassettes now and have tried many shifters. About any 11sp derailleur should work fine, if going with Shimano the long cage (SGS) would be the better choice over short (GS). I have this with a SRAM GX derailleur and love it so far! I have the Sram GX derailleur on a 2017 Specialized Camber. Would this work? BEST ANSWER: Should work fine, but you'll need a longer chain probably. Is this compatible with only 'SRAM' xd driver body or anothers xd drive body are compatible too? BEST ANSWER: I believe XD driver is for SRAM only. I.E. a Spank XD driver is making a spank hub compatible with SRAM XD compatible cassettes. DT Swiss etc. So yes XD is needed for the Hope 9-46 cassette. Hope this helped. Should be compatible as long as it is "XD driver"
I have a friend that is using Chris King Hub with XD driver and this cassette. Another friend is running Onyx hub with XD driver as well. It'll work with any XD Driver you can find. Awesome cassette with a huge gear range and light weight. Perfect for my riding. Gotta get up to get down!! I have this cassette on the Chris King CD Driver and it works just fine. If the xd driver is the same as a sram, it will work. Is this compatible with SRAM XD Driver Body? BEST ANSWER: Yes, Actually I believe its ONLY compatible with XD driver. It was a breeze to install with exception of one thing ; After you install the large cogs make sure to remove the plastic spacer from the smaller cogs - then tap it onto the driver body with a rubber mallet and then install the smaller cogs. All good answers. This cassette requires a XD driver. Also, I had difficulties getting the smaller cogs to attach to the larger cogs initially. Tapping the plastic spacer on first is good advice. This will make more sense when you have the pieces in front of you. In fact, as long as I know, it´s only compatible with XD Driver Body.